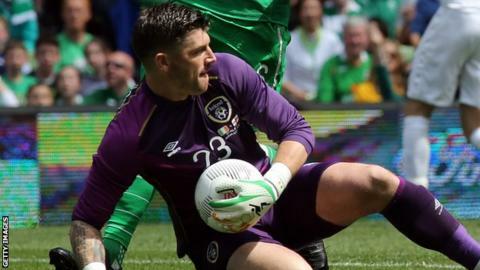 Sheffield Wednesday goalkeeper Keiren Westwood could be a doubt for the Republic of Ireland's World Cup qualifiers against Georgia and Serbia. The 32-year-old needed six minutes of treatment after clashing with Burton's Marvin Sordell in Saturday's 1-1 draw. Despite trying to carry on, he was forced off after 35 minutes. "I'm sure that if he came out (of the game) and it was a hard kick that he will have some days out of training," said Owls boss Carlos Carvalhal. Sordell was not punished by the referee for the challenge, but Carvalhal felt he should have been sent off. "In my opinion it's a clear red card. I don't understand when my goalkeeper kicked the ball and stayed down and must go out, so something happened there," he told BBC Radio Sheffield. "I think it was a kick, and the referee saw it and he didn't give even a yellow card, so I think it made a big difference." The Republic play in Georgia on 2 September, with a home game against Serbia three days later. Martin O'Neill's side are currently second behind Serbia on goal difference only, with 12 points from six games.